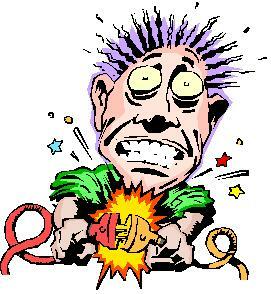 The 2 Major hazards attributed to electrical equipment and wiring are electrical shock and fire. Electrical shock occurs when the body becomes part of the electric circuit, either when a part of your body comes in contact with both of the active component (Active/Neutral)wires of an electrical circuit, or one wire of an energized circuit and the Earth wire (or grounded wire)…., or a foreign conductive object that has become energized by contact with an electrical conductor. The severity and effects of an electrical shock depend on a number of factors, such as the pathway through the body, the amount of current, the length of time of the exposure, and whether the skin is wet or dry (ie sweat). Water is a great conductor of electricity, allowing current to flow more easily in wet conditions and through wet skin. The effect of the shock may range from a slight tingle to severe burns to cardiac arrest. The chart below shows the general relationship between the degree of injury and amount of current for a 50-cycle hand-to-foot path of one second’s duration of shock. While reading this chart, keep in mind that most electrical circuits can provide, under normal conditions, up to 20,000 milliamperes of current flow. So only a very small percentage of current leaking to earth can cause harm if touched by your body… as little as 30 milliamperes of current can KILL !!! In addition to the electrical shock hazards, sparks from electrical equipment can serve as an ignition source for flammable or explosive vapors. Even loss of electrical power can result in extremely hazardous situations. Flammable or toxic vapors may be released as a chemical warms when a refrigerator or freezer fails. Fume hoods may cease to operate, allowing vapors to be released into the work area. So take care with your electrical equipment and consider all contingencies in the operation of that equipment. Tested & True ~ test & tag Adelaide uses the very latest in Portable Appliance Testing…The STC Pro Logger 2 it can perform RCD testing, Earth Leakage Detection and Run Testing all in one neat piece of equipment. On top this all our Technicians are Trained to National Standard UEENEEP008 in test & tag operations by Intertag in Sydney NSW, all our Equipment is in good repair and in Calibration. Most of all we pride ourselves on our Knowledge of OH&S legislation and the current Australian Standards ensuring that you get Quality Service at a competitive price. This entry was posted in Electrical OH&S Compliance, Electrical Safety, test & tag Adelaide, Test & Tag Fact Sheet, Uncategorized and tagged Adelaide, Appliance Safety, Electrical Safety, PAT testing, tagging, testing, Workplace Safety. Bookmark the permalink. My Safety Switch has tripped… What should I do NOW ! ?